← Best Value Wine Destination in the U.S.A.? Early in my wine drinking years, this was my mantra and justification for buying cheap wine. As you drink more wine and increase your wine budget, you start to realize that every vineyard, winemaker and label can taste radically different. How is this? It doesn’t seem to make sense. Well, I will try to put some of that Sommelier training to good use and explain why and how individual wines can taste so different. We will start with Winemaker Techniques in Part One and then move on to Vineyard Management in Part Two. I will focus on red wine in this piece, because it has the most diverse flavor potential. You may ask, why should anyone care? Good question. Many people feel, “If it tastes good, I drink it.” For those who feel that way, I get it… but for those that are looking to understand why they enjoy a certain wine and not another… read on. How Do Winemakers Affect Wine Flavors and Aromas? Pinot Noir – Fruit flavors of cherry, cranberry, raspberry, etc. Herbal and mineral notes of mint, earth, limestone rock, etc., depending on terroir. This wine is mostly less acidic and has very limited tannins. It can have a silky mouthfeel, but never a voluptuous mouth-coating texture. Not commonly made to bottle age, with the exception of wines from Burgundy, France. Cabernet Sauvignon – Fruit flavors of blackberry, black currant, black plum, etc. Herbal and mineral notes of tobacco, graphite, earth, etc., depending on terroir. This wine can be very acidic and have very high tannins. It can be watery, silky, or very rich in texture. Very commonly bottle aged and often improves substantially over time. Inoculating the Juice with Commercial Yeasts, or Allow Natural Yeasts to Ferment? This is a controversial topic in the industry. Some winemakers swear natural yeasts add complexity and interest to the wine. Commercial yeasts may add to a “cleaner” flavor profile, but offer a taste that appears to be more manipulated. Wild yeasts may contribute to a more natural, complex character. Use Extended Cold Soak, Before Fermentation? This can contribute to a more “extracted” wine. The idea is to take the time and extract as much flavor as possible from the skins, pips and flesh of the grapes. Wines that are cold soaked tend to have rich, deep colors. They may also be fruitier, but I have not noticed this consistently. The challenge is preventing natural fermentation during the process. The tanks must be kept in refrigerated areas during cold soak. This option ties up tank space and potentially limits production, adding cost to the vinification process. Pump Over, or Punch Down the Cap During Fermentation? You wouldn’t think this would make a difference, but I have consistently noticed wines fermented with a pump-over process tend be more refined and elegant as a whole. Ferment in Stainless Steel Tanks, Plastic Containers, or Oak Barrels? There are those that claim stainless steel can add to minerality, but I have not seen this consistently. Plastic is basically neutral, but when the juice is fermented in oak barrels and then the wine is aged in oak too… you often end-up with very oaky tasting wines. For example, these Northern California producers tend to have this flavor profile: Silver Oak and Caymus. Although, they may, or may not make their wine this way. Block Harvest Vines by Area, Vinify and Blend? 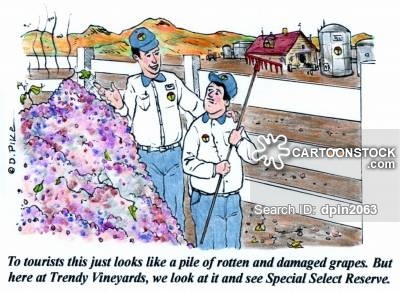 Estate wineries that use this method produce better wines – period. Micro-terroir is a concept that is very real. Numerous factors can cause block variation in the fruit. These differences influence variable fruit characteristics: more acidity, riper, additional minerality, etc. The real talent is the winemaker’s palate and experience that can determine the appropriate blend to build a fine wine profile. This produces softer wines, but adds yeast, or butter flavors. I enjoy this character, even more in white wine. I think this is more of a personal preference consideration. Ferment with the Full Grape Clusters? This is often confused with Carbonic Maceration, a process used on inexpensive wines to add enhanced fruit, or “candy” (bubblegum) flavors. Full cluster fermentation is a much less intrusive process. This technique can add a deeper fruit character to the wine. 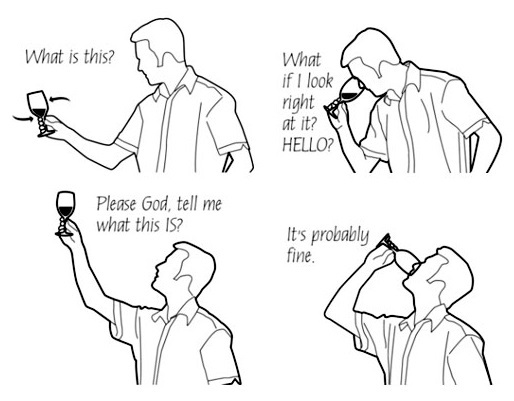 I enjoy wines utilizing this process. Include the Stems During Fermentation? In the hands of a master winemaker, this can add a significant amount of interest to the wine – improving tannic structure and adding briarwood flavors. When not handled well, it can truly make wines undrinkable. For a winemaker, experimenting with this is like playing with fire. Include Pressed Juice, or Only Free-Run Juice? This decision can add a significant amount of cost to winemaking. Only a third to half the extracted fruit juice is typically free-run. After that is collected, the pressed juice steadily becomes thinner, less complex and more rustic, as more pressure is applied. For example, one ultra-premium winery I know, uses only free-run juice and sells their pressed juice to other wineries. Filter, or Fine the Wine? Historically, this was always done. Today, with more modern wine producing technology, it has become a decision. Previously, this was required to remove impurities from the wine and improve clarity. Today, when omitted, it can offer a more highly textured character to the resulting wine. Maceration is the process that uses the fruit’s own weight to break the skins and extract the free-run juice. Extending this process works well with the Cold Soak option discussed above. When done together, there are notable differences in the wine. These wines tend to be softer and more extracted. Very interesting wines can be produced by blending this with traditionally produced wine. In colder vintage years, this can help to offset the more rustic character of the wine. Allow Residual Sugar to Remain and/or Add Fruit Juice After Fermentation? These are more common options in the U.S. today. The Predator is an example of such a wine. Many of these are sold in big volume across the U.S. Personally, I do not like these wines. They give me a headache and are lousy paired with food. Age in Stainless Steel Tanks, New American/French/Hungarian Oak, or Neutral Oak Barrels? There is more experimentation with this idea today than in the past. Previously, you would never have seen red wines aged in Stainless. Today, I run into these more and more. Regarding the choice to use new, or neutral oak barrels… personally, I am not a fan of oaky wines. For me, the only advantage of new oak is to deliver the toasted flavors that will be discussed below. I think wines often taste better when aged in a less manipulated neutral oak style. Use Light, Medium, or Heavy Toasted Oak Barrels for Aging? Toasting the oak barrels in which wine is aged can add surprisingly pleasing flavors. My favorite flavors from this option are baking spice and cinnamon, but it can also impart other characteristics such as a smokey aftertaste. Now that all this information is at your fingertips, what can you do with it? Of course, you can always impress your friends with your wine knowledge at dinner parties… or you could put it to good use investigating new wines you might enjoy. My personal favorite is discussing pros and cons of these techniques with winemakers when my wife and I are vacationing in wine country. However you put it to use, the understanding of how wine is made can truly add interest to your enjoyment of wine!